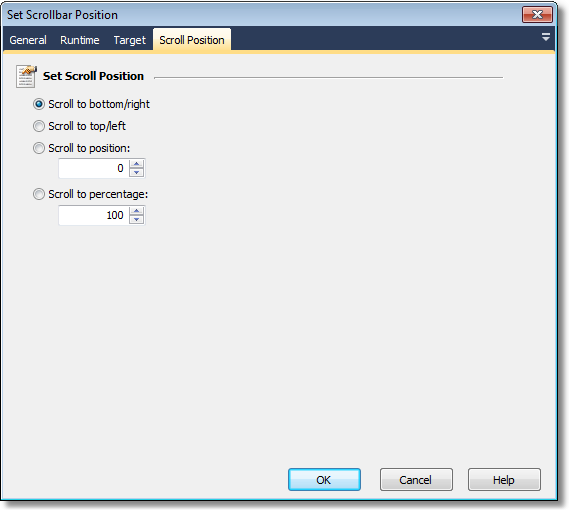 The Set Scrollbar Position action allows you to move a scrollbar to a desired position. Use the Target Property Page to select the scrollbar to move. If you use the automatic configuration mode, then this will ensure that the control you select supports scrolling. Hint: To select the scrollbar of a window, you will need to control-click on the scrollbar, not the window itself. Tip: If the scroll bar you want to move doesn't support standard scrolling, you may still be able to automate it using the Perform Mouse Click action. Alternatively, ask the software's developer to add support for standard Windows scroll functionality! Select this option to scroll a vertical scrollbar to the very bottom, or a horizontal scrollbar to the very right. Select this option to scroll a vertical scrollbar to the very top, or a horizontal scrollbar to the very left. Select this option to set the scroll position to an explicit value. Note that different scroll bars can have different value ranges, so it's not recommended that you use this option unless you know a lot about the scroll bar in question. For some scroll bars, certain values may be inaccessible, so the action will set the bar as close as it can. Select this option to set the scrollbar to a certain percentage of its available range. 0% is the topmost (or leftmost) position of the bar, and 100% is the bottommost (or rightmost) position. This action cannot move a disabled or invisible scroll bar.